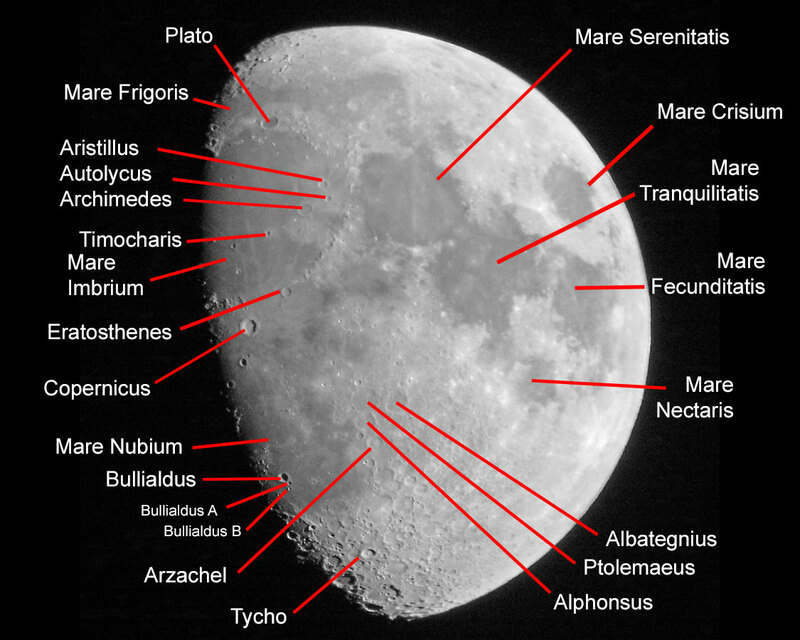 On this page, the moon can be seen from shortly before Half Moon until shortly after Half Moon. 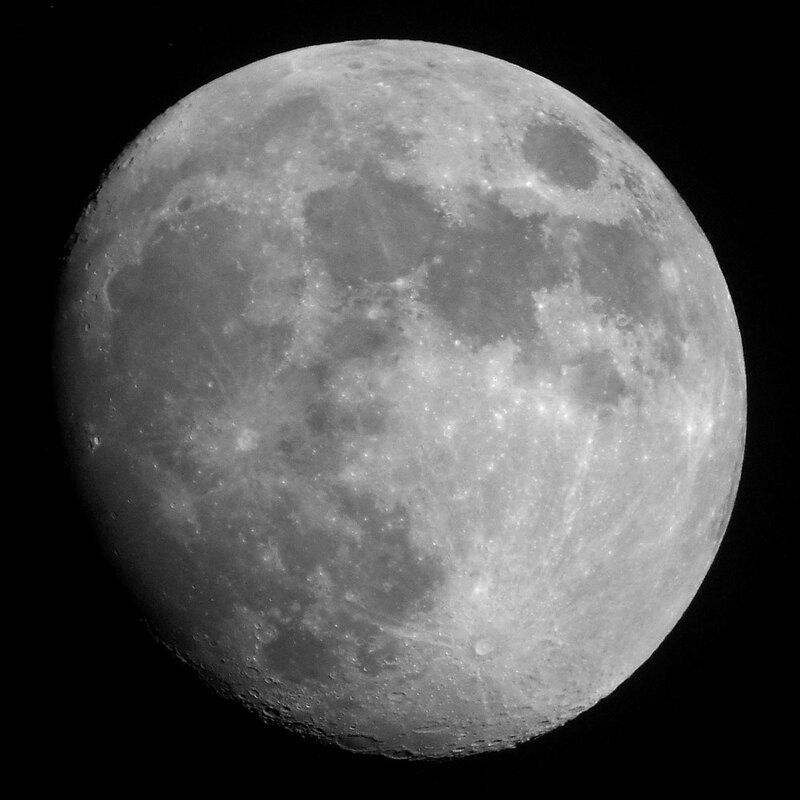 See also page From Half Moon to Full Moon (RX10 M3). 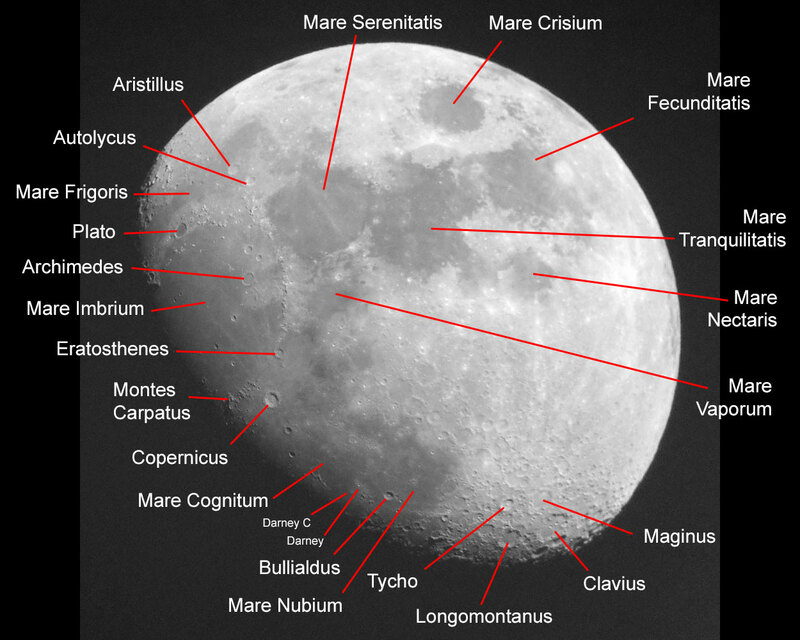 The following photos show the moon after Half Moon. The photos are rotated by 180 degrees or mirrored so that they correspond to the normal visual impression. 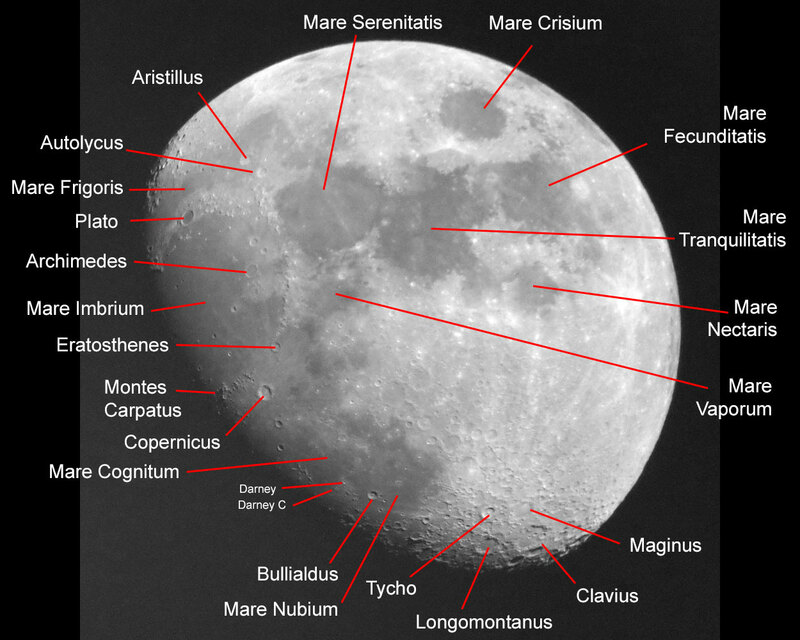 This newer photo of the moon was taken on February 24, 2018 - one day after Half Moon (Half Moon was on February 23, 2018, shortly after 9 a.m.). 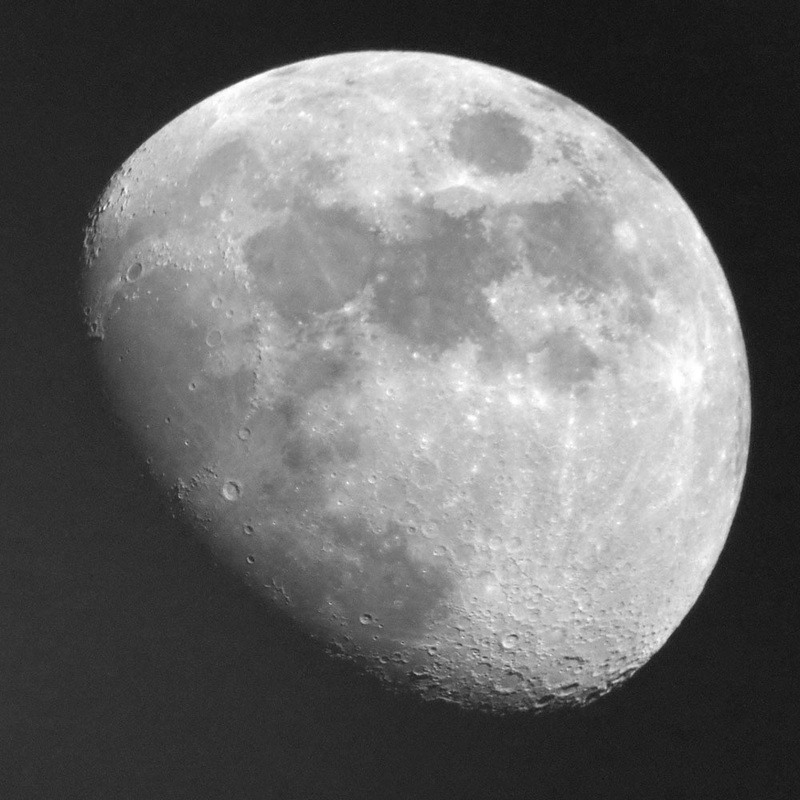 The photo was taken with the Sky-Watcher Skymax-102 OTA and again with the camera held to the eyepiece. 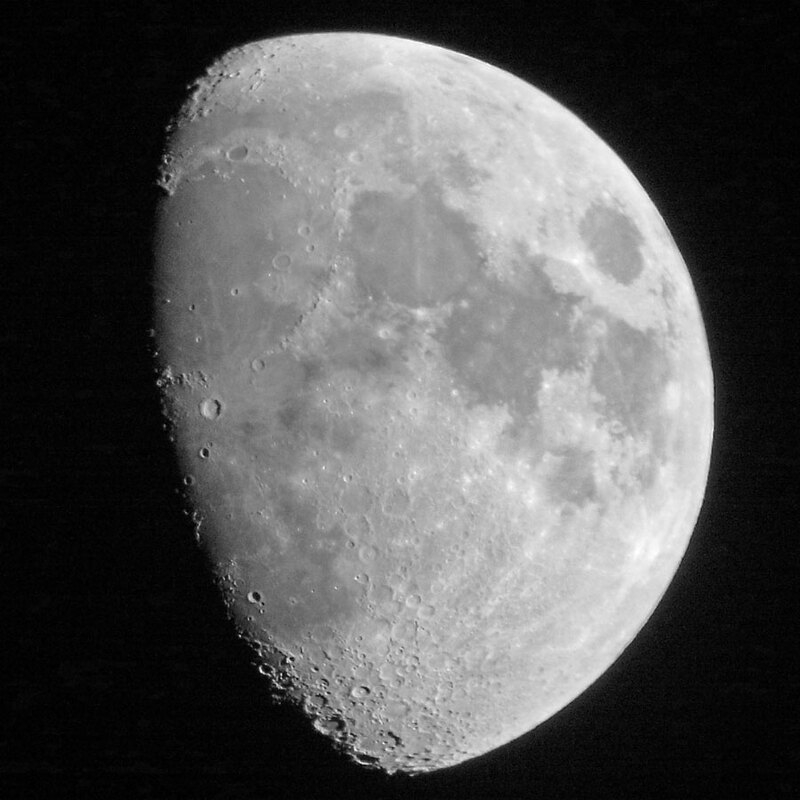 Now a photo of the moon, which was taken with the Sky-Watcher Explorer 150PDS and the camera held to the eyepiece (May 5, 2017; two days afters Half Moon, which was on May 3, 2017 at about 7:40 p.m.). 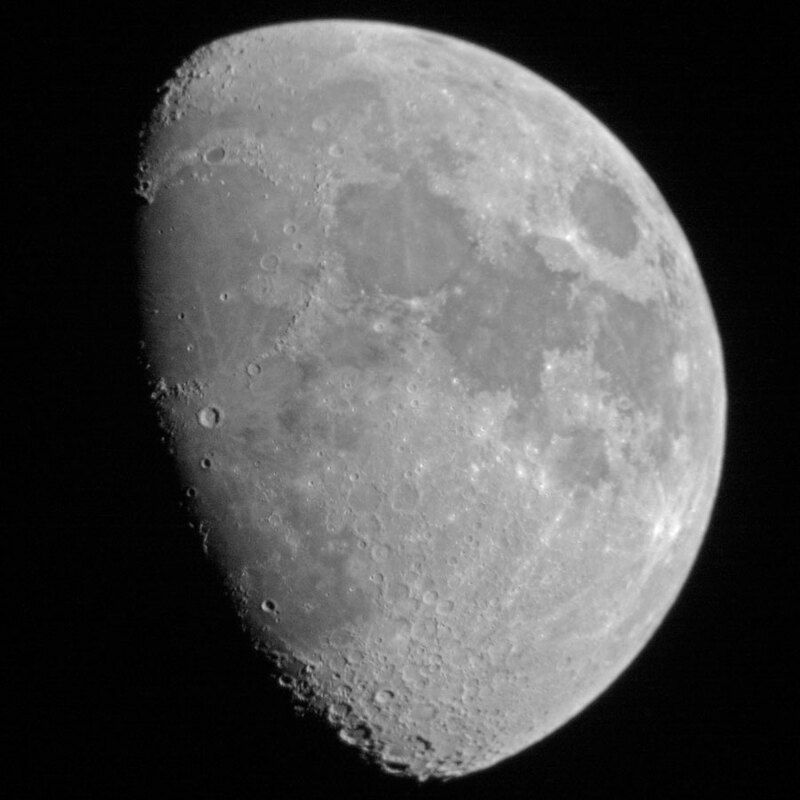 Two more photos taken with the 5" Sky-Watcher Heritage P130 telescope and the camera held to the eyepiece (April 23, 2010; Half Moon was on April 21, 2010 at about 7:20 p.m.). Bullialdus A (26 km diameter) and B (21 km diameter) serve as examples of small craters that can be recognized. They are probably not representative for the original photo, which was downsampled considerably for this purpose. 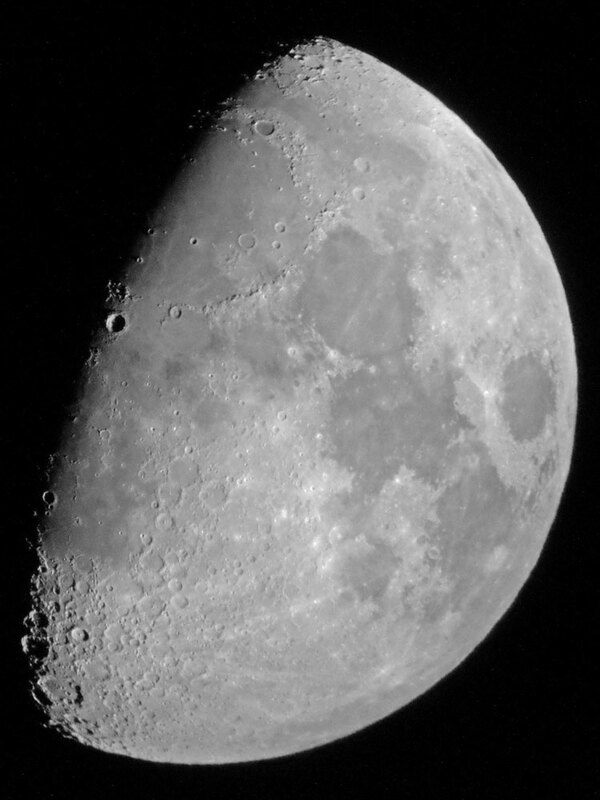 Now, two photos that were taken with the 6" Newtonian telescope Sky-Watcher Explorer 150PDS with the camera held to the eyepiece (April 6, 2017; Half Moon was on April 3, 2017 at about 7:40 p.m.). 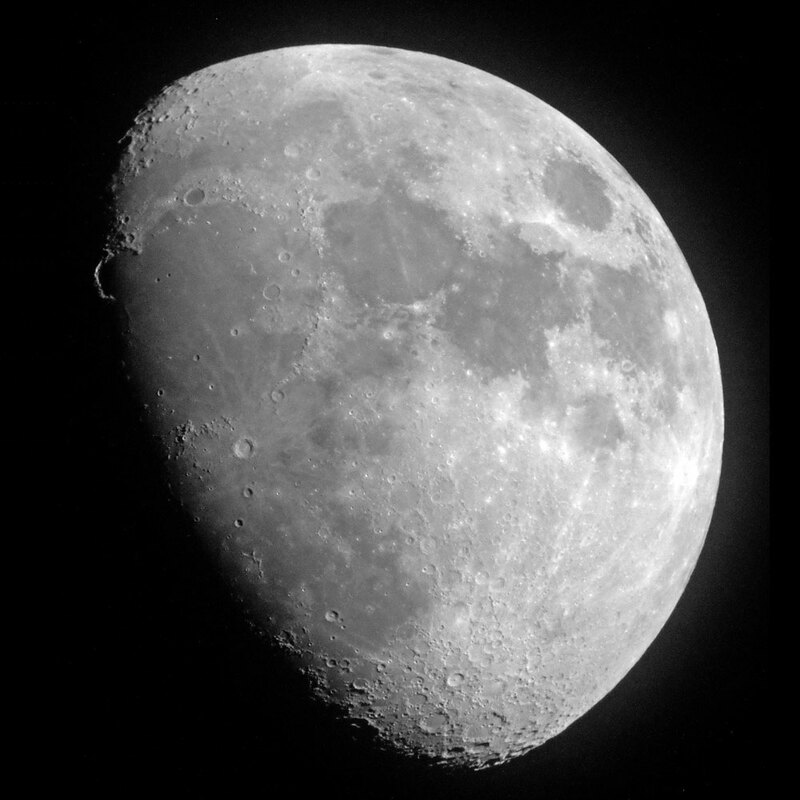 Darney (15 km diameter) and Darney C (13.3 km diameter) serve as examples of small craters that can be recognized. 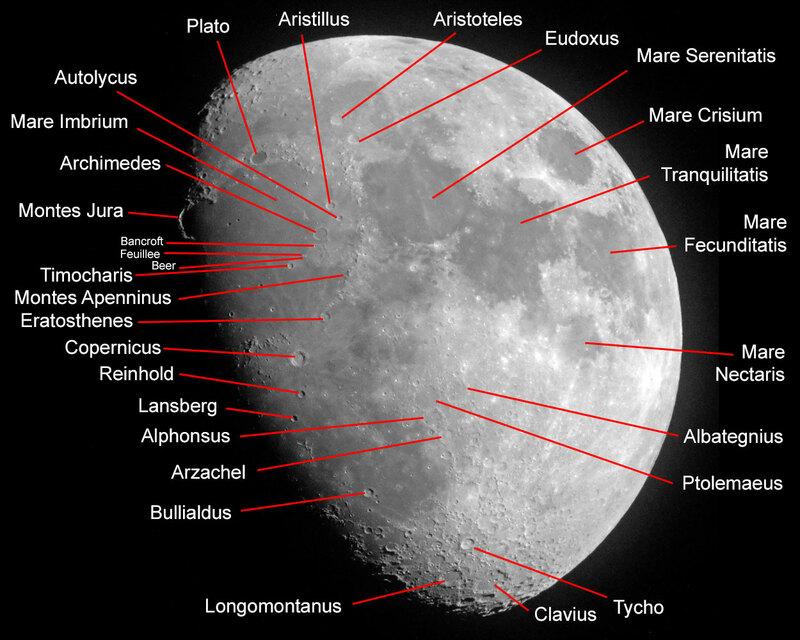 This newer photo of the moon was taken on February 25, 2018 - two days after Half Moon (Half Moon was on February 23, 2018, shortly after 9 a.m.) and shows the "golden handle" (Montes Jura) at the upper left. 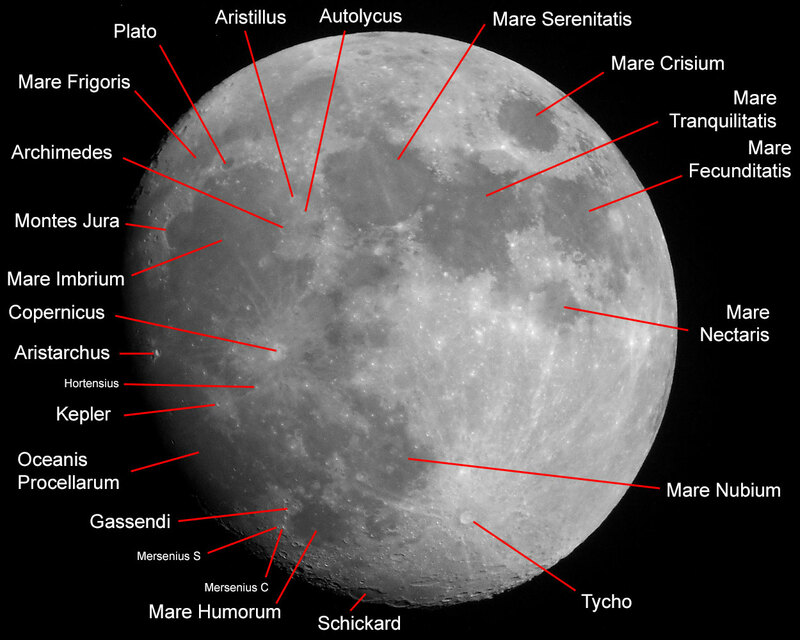 The photo was taken with the Sky-Watcher Skymax-102 OTA and again with the camera held to the eyepiece. 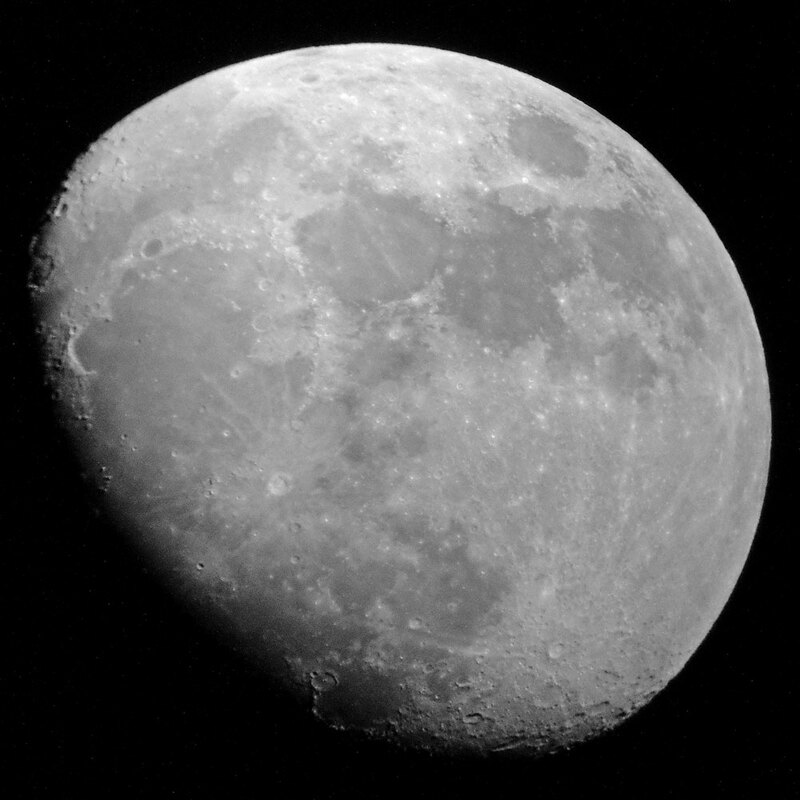 This newer photo of the moon was taken on February 26, 2018 - three days after Half Moon (Half Moon was on February 23, 2018, shortly after 9 a.m.). 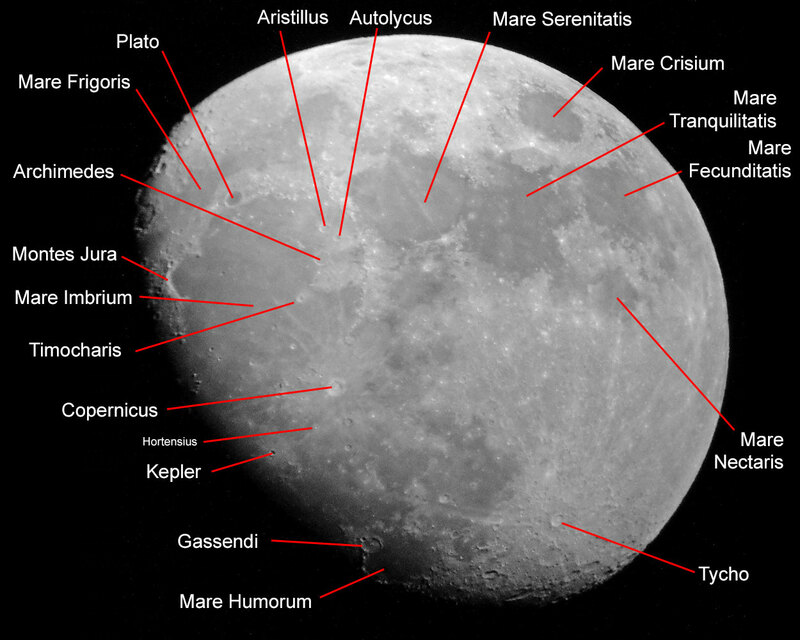 The photo was taken with the Sky-Watcher Skymax-102 OTA and again with the camera held to the eyepiece. 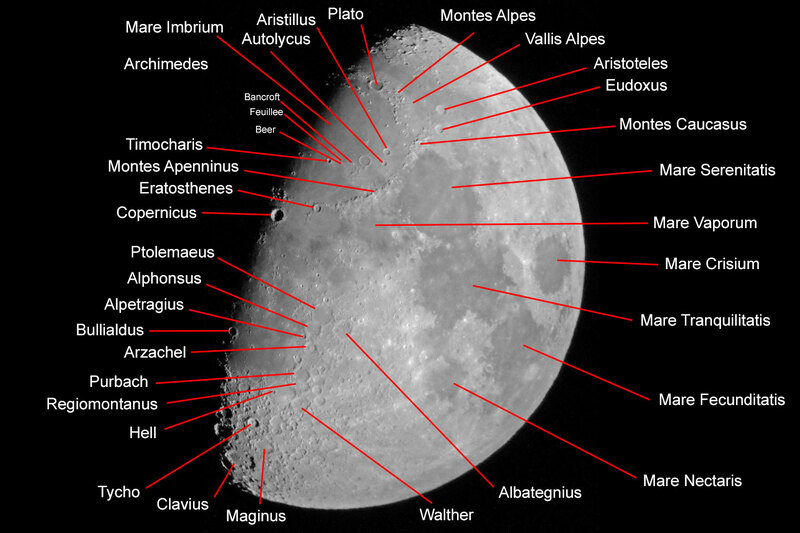 Hortensius (15 km diameter) serves as an example of small craters that can be recognized. 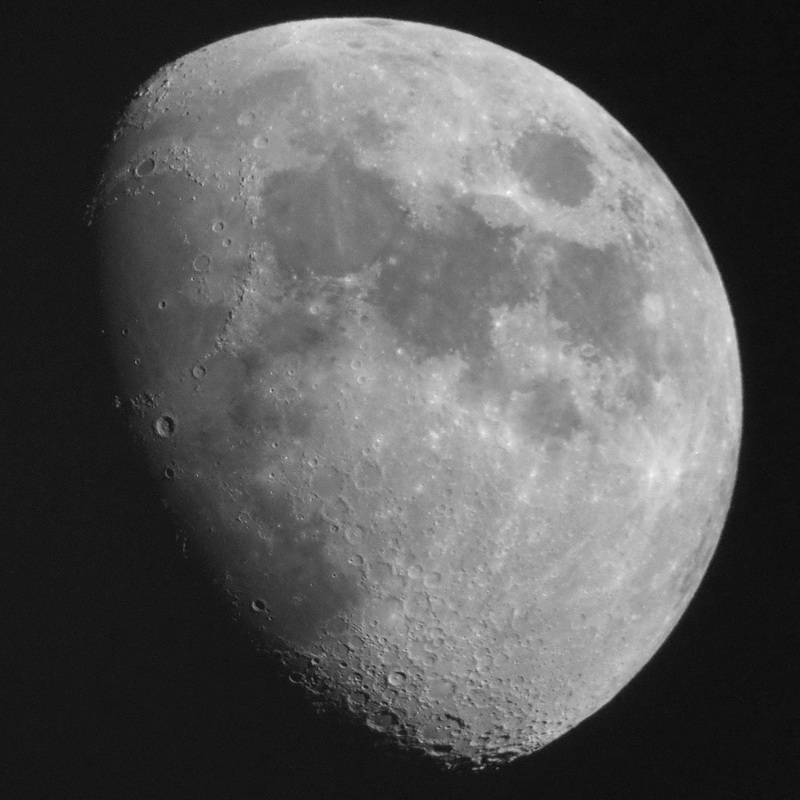 This newer photo of the moon was taken on February 27, 2018 - four days after Half Moon (Half Moon was on February 23, 2018, shortly after 9 a.m.). 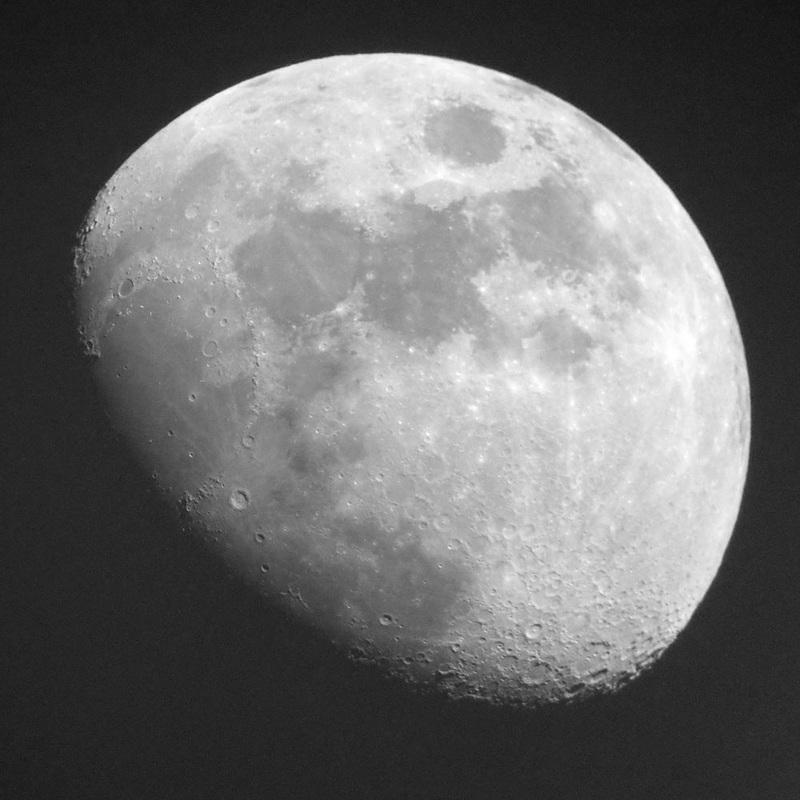 The photo was taken with the Sky-Watcher Skymax-102 OTA and again with the camera held to the eyepiece. 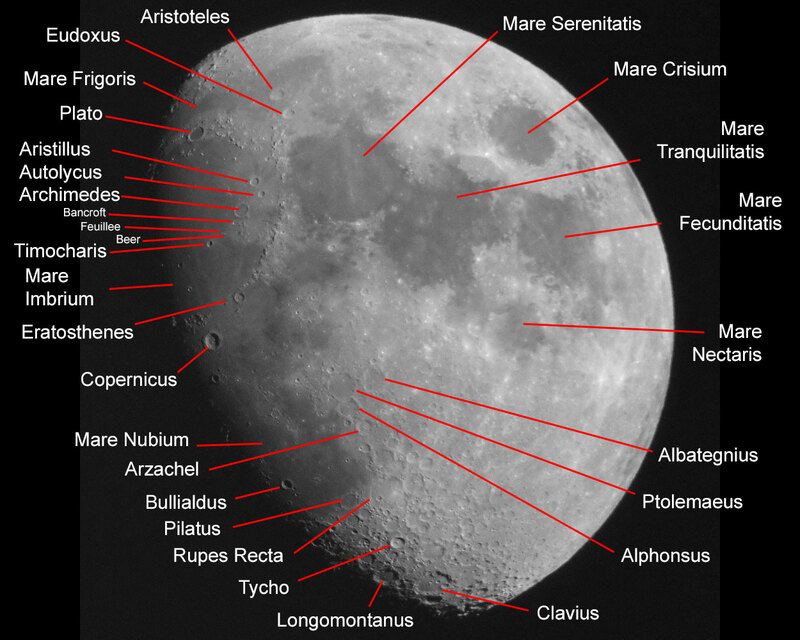 Mersenius S (16 km diameter), Mersenius C (14 km diameter), and Hortensius (15 km diameter) serve as examples of small craters that can be recognized.